You may have seen on our Facebook or Instagram pages that we introduced six brand new themes for 2019! They are – 90’s, Arabian Nights, Llama & Cactus, Mermaid, Vintage Halloween and Vintage Christmas. What a lineup! Over the next few months, I will be introducing each of these themes to you, along with giving tips & inspiration on how to use these new products. I can’t wait! 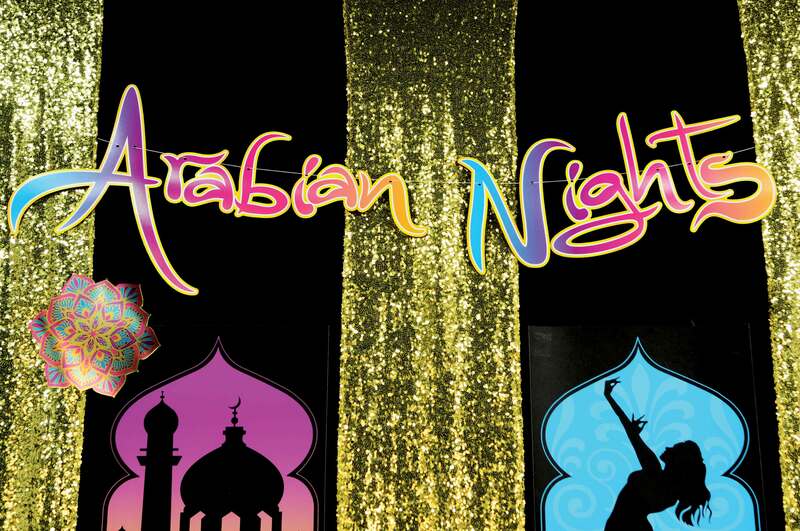 Today, let’s take a look at Arabian Nights. This unique theme would be great for a birthday party or even a theme for prom. Take a look below at these gorgeous, magical decorations and a few tips for how you can use them! 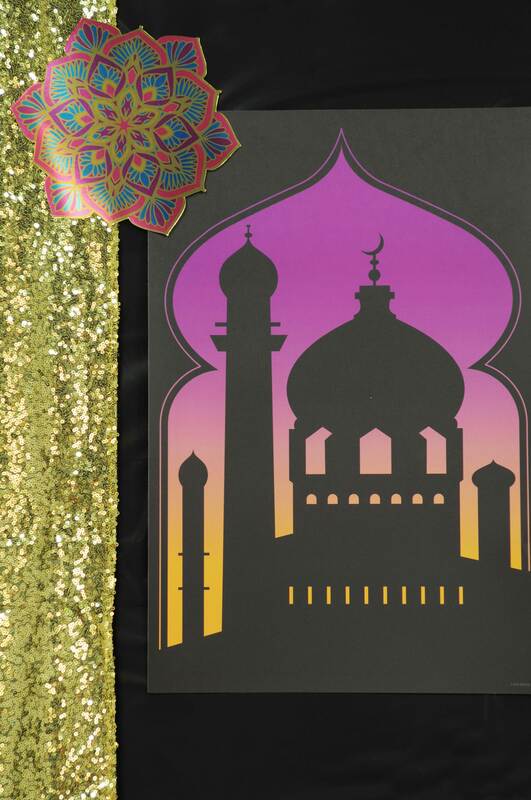 You can tell in the image below that if you slightly dim the lights and throw in a few gold sequined items, these decorations truly appear to “pop” off the walls. 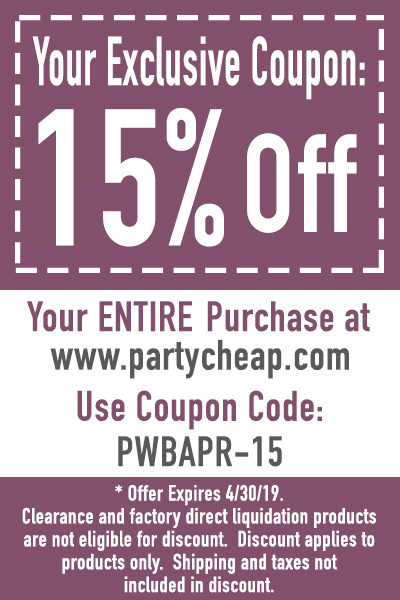 The bright colors are sure to make a statement in any party setting. 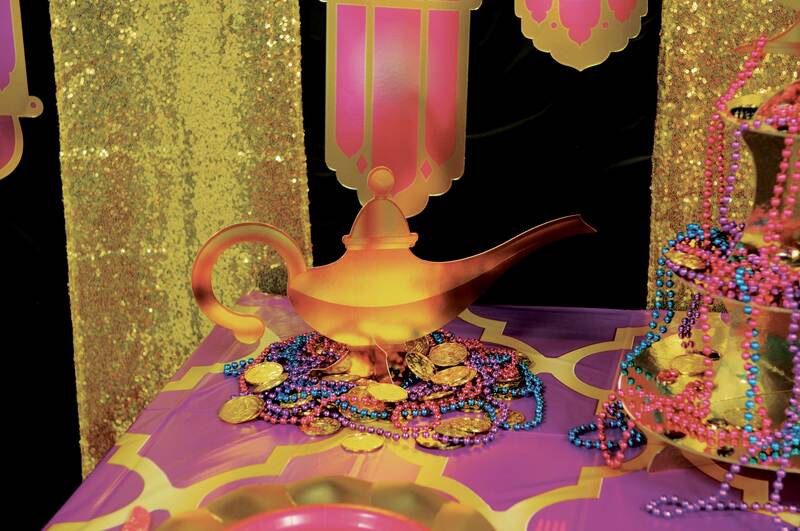 The Arabian Nights theme has everything you need to throw your event – streamers, cutouts, centerpieces, whirls, a tablecover…it has it all. Additionally, there are tons of options to add accent decor to enhance the theme. For example, I added gold sequined table runners, party beads, metallic gold & cerise tableware, plastic gems, a metallic gold cupcake stand, gold plastic coins and a metallic gold table runner, which all paired perfectly to the main theme. 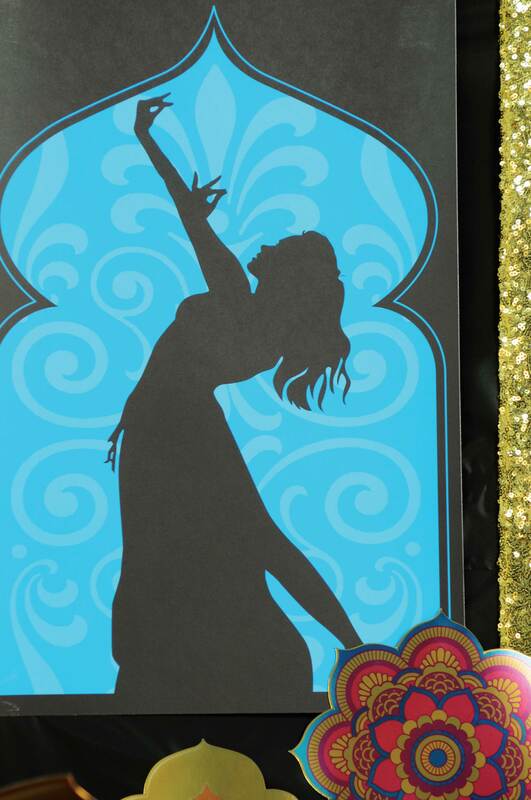 My personal favorite item from this theme is the silhouette cutouts, which you can see in the image above, as well as the image below. The colors in these are gorgeous! A cupcake stand can serve as a wonderful centerpiece…even if you don’t actually put cupcakes on it! 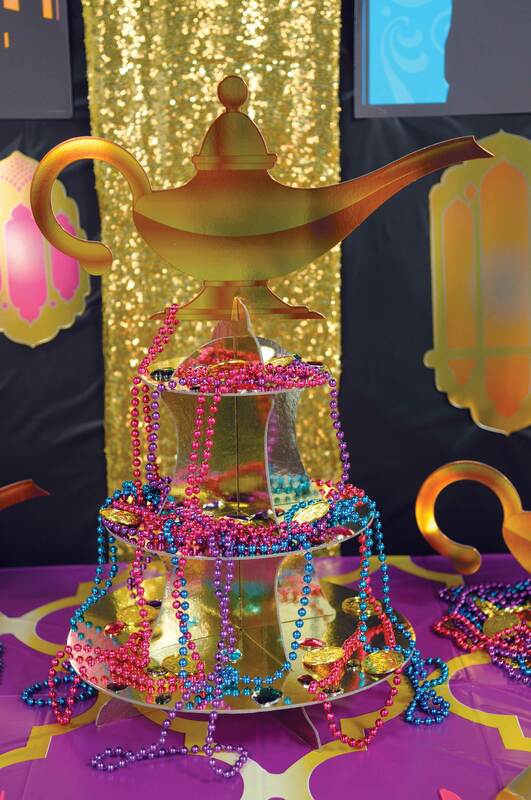 For this theme, I chose to drape a few party beads down the sides and embellished with some plastic gold coins and gems. To really personalize it for the theme, I used lamp cutout and placed it on top of the stand. I really like how this turned out and it was extremely simple to create. 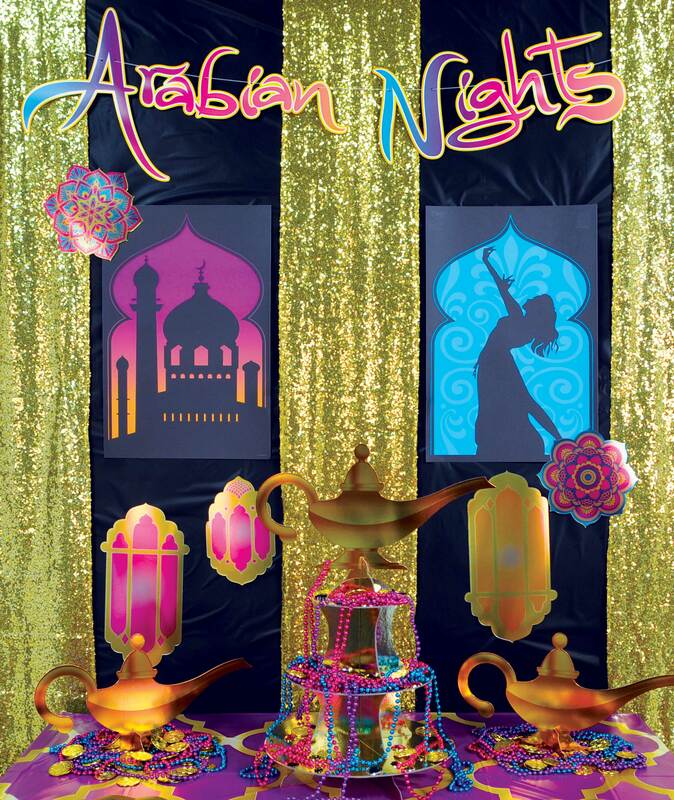 There are lots of color options to pair with Arabian Nights. I chose to use both metallic gold and cerise tableware, which proved to match great with the rest of the decor. 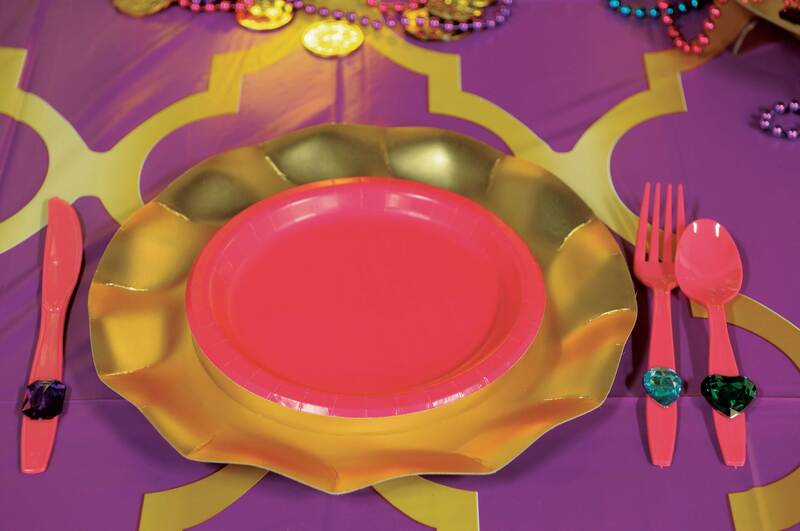 Other options would be purple, turquoise or orange plates, napkins, plasticware & cups. Or, use a mix of all of them! I hope you love this new theme as much as we do. I can’t wait to see how everyone uses these decorations!